Many of my Master’s students ask me which conferences they should be attending so I have made a list to help them out. I have only put a few of the bigger conferences, so remember there are many more. Also I have organized them by career choice as my students go into corporate, higher ed, and K-12 fields. And so it begins…first day of classes 2012! Very excited to kick off this semester. I will be teaching instructional technology for educators (2 sections to undergraduates), Online course design, development, and teaching, Colloquium, and finally graduate student projects. The course I am most excited about this semester (I am excited about all of them) is my online course design class. In this course I am going to be doing some very exciting things. Besides going over topics like online best teaching practices and such, students will be designing their own courses using Moodle. I will have each student purchase their own web address and teach them how to install/setup their own Moodle course. Additionally, in this course, the students will form groups and each write a topic paper on online learning. I will then take each groups’ topic paper and put it into a free opensource reference guide or book for all to use. Well here’s to another good semester! – Make your profile private – do this so that only your friends can see your wall, photos, page, status updates, etc. – Do NOT become friends with your students. Do NOT chat with them on instant messenger, etc. While I will be friends with my students, they are 18 years old. I would never be friends with a student that is a minor. Just do not do it. – Make a separate profile for work friends. I do this using LinkedIn. That way my colleagues can be my friend but do not have to see all of my personal photos if I choose to post them. – The final thing – check the privacy settings at least once a month. Facebook tends to change their settings all the time, so please double check yours to make sure they are correct. Games are becoming significantly easier to create. I say this because the most popular games on the market right now like Mass Effect 3 and SWTOR use off the shelf, free, game engines. Normally, games are developed using their own engines, which take a lot of time and money to develop. However, off the shelf engines are becoming just as good. The best part is that many of these off the shelf engines are free and opensource. Now before I get into ease of development, these engines still require a significant amount of programming and are not really made for the novice. However, there is a trend to make these engines more designer friendly, meaning less programming and more ‘building’. Examples of this can be seen in Google App Inventor (now at MIT), Scratch, Squeak, Gamemaker etc. The reason that game engine designers want engines to entail less programming is that programmers are not game designers, they are programmers but at this point only the programmers can use the engines. They want and need designers to use their engines to build games, which will in turn make their engines more popular. This trend is happening in training development as well. We are seeing a push to develop with software like Articulate, a program that does not take a lot if any programming experience to develop sound instruction. This makes the instructional designer also now a developer, and more marketable as programmers are not required to develop the instruction. This however, does take time away from the instructional designer thus someone still needs to develop whether it’s the programmer or designer. Essentially the point of this post is that I see game and training development starting to fall into the hands of the designer more than it is. In fact, I would not be surprised if our field starts focusing on ‘building’ – that is understanding programming logic and constructing games and training, instead of actually having to program at all. – Preparing the course schedule. What are we going to be doing each week? – Preparing readings. I usually do NOT use a textbook. I usually find that latest and greatest research articles and have students read them. I also usually include significant pieces from the field. – Going through my course materials and developing course materials. I need to plan the course and assignments. I generally change my courses at least by 80% each semester so I need to rethink everything. – Developing materials for the first few classes. I usually only develop my PPT slides (if used) and class activities for the first 2 weeks of class. I find that when I develop them for the whole semester they end up needing to be modified a lot because not every class is the same. Things need to be tailored to my students, in the specific class, which usually takes me a week or two to pick up on. – Planning assignments. This is the hardest part. What do I want my students to accomplish in my class? This is the product that they will leave with. I want this product to be something that they can add to their portfolio to show employers. I also want this product to be something that will help them when they are working professionals. This usually involves a lot of work thinking through the assignments, how it is due, if its going to be done in groups, etc. I am a big fan of having students create a scenario or working with clients, then developing a project around that. I generally have various parts of the product due throughout the semester so I can give feedback before the final product is completed. I am also a big fan of students peer reviewing each others’ work. – Prep also involves contacting students, making sure they know how/where to get to class the first day. This is essential in my program since some students may be using webex (virtual classroom software) to attend class. – Setting up my course website. Whether using blackboard or my own website, I need to make sure all the course materials are posted. Im sure I am missing a few steps but as you can see it’s a lot of work, planning, and thinking – and my semester has not even begun! 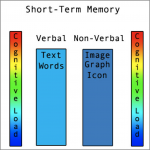 The following video describes dual coding theory as well as cognitive load. The point of the video is briefly explain the main concepts around this theory. For more in depth analysis I would suggest the literature and in fact I will post some that I have written. Also, here is the image I used in the video if anyone would like to use it (for educational purposes citing me of course). Are we overestimating technology use in younger generations? The students are not inundated with technology in their classes. In fact, many come to my technology classes with a little anxiety because they are going to have to use the computer in new ways. What I find is that many of my students are comfortable using Word and Powerpoint. They can check email and do basic web searches using Google. When I ask who has heard of Google Docs, maybe 1% of the class raises their hands. And this isnt just Google Docs, this goes for many Web 2.0 technologies with the exception of Facebook. Do these students all have new iPhones? I find that in general, less than 50% of my students have smartphones. In fact, some have hand me down smart phones from their parents. None have ipads but a few have used them because their parents might have one. All of my students have laptops. None have standard desktops. This is not surprising as the cost of laptops has decreased a lot in the last few years. A portion do have Macs which are more expensive. So what does this all mean? I believe it means that these students are not using every new gadget that comes out. They do not have the money to buy the latest smart phones. And they are not tech experts, in fact, they are just as nervous about new technology as older generations in my opinion. Now will this change? I believe so. I have observed the current elementary/middle school students doing significantly more with technology in the classroom. So I believe in the next 5-10 years the undergrads will be much more technology driven than the current generation. When I was a kid, I used to love walking into the computer lab for computer class. We used to play Carmen San Diego and Oregon Trail. It was neat to learn that I could do an activity using technology. We had Apple IIe computers and if you were lucky you had a Mac. In college it was more of the same except I wanted to see my colleges computer labs have the latest and greatest hardware and web development software like the Adobe (then macromedia suite). I was so disappointed that they only upgraded their computer every 4+ years. That’s crazy I thought. Computers are done in 2 years. Then again public education has always been underfunded so it was not really surprising. LETS GET RID OF COMPUTER LABS IN ALL K-16 PUBLIC SCHOOLS. Yep you heard me right. Let’s get rid of them. Now I am not saying lets get rid of computer education. Quite the contrary, I just have another solution. Computer education is probably one of the best skills students of all ages can have. For instance, when I started working in the corporate sector after I completed my masters degree, the company I worked for expected me to fully understand MS Powerpoint, word, excel, and visio. What I didnt expect was that they also expected me to make graphics and use a database among other things and this was for a general business job. It was not a computer oriented job. So yea, those computer skills were extremely helpful. Fortunately for me, I am a tech guy, so it was easy to do all of those tasks. Get rid of computer labs and create a cloud based network. Thus students would be required to all have their own computers (mac or pc would not matter). They would come into a regular classroom and log in to the cloud network where all of their software and files would be. That way the school would just need to keep up the cloud and keep up the software updates – most of which they do now. They would no longer be required to use their funds for computers that are quickly outdated and would not need to waste the computer technicians time fixing half of the labs computers each day because students put viruses or whatever on them. Now students and parents would be responsible for their own computers. This would also be a huge advantage for the student. Now they would not need to worry about working on a computer, forget to save the file, only to find it deleted when they come back the next day. I cannot tell you how many students lose their projects because they are working on a school computer. Anyway, I believe this is where we are headed and it is a solution to better our labs and save schools money that they already do not have. And if for some reason US schools do get properly funded as they are in many nations across world, I would still call for this change.